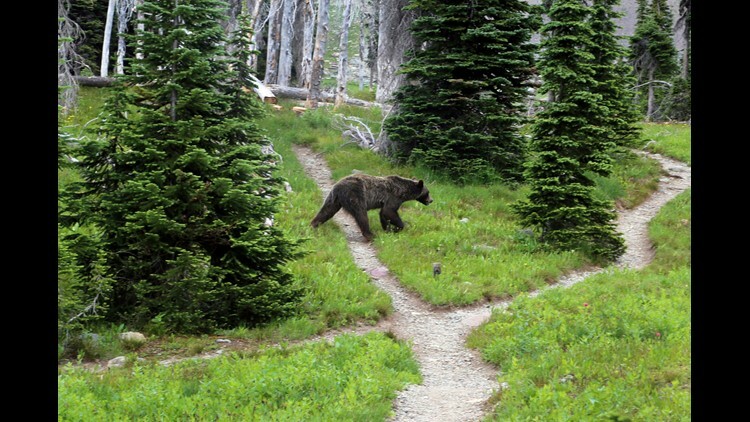 FILE - In this Aug. 3, 2014, file photo, a grizzly bear walks through a back country campsite in Montana's Glacier National Park. A young grizzly was reportedly killed after being hit by a truck south of Choteau on Tuesday night. WEST GLACIER, Mont. – On July 15, rangers discovered a partially paralyzed grizzly bear that had apparently fallen about 20 feet onto the road near Rim Rock. The bear had sustained severe traumatic injuries. Rangers euthanized the bear after consulting with the park’s wildlife biologist. The National Park Service conducted a necropsy and found significant trauma to its thoracic vertebrae, broken ribs and a dislocated hip. The non-lactating female bear was estimated to be between 5 and 7 years old and appeared to be in otherwise good health. Rangers initially thought the bear had been hit by a car, but evidence at the scene showed that the bear had slipped off an overhanging precipice and landed on its back in the road. There are an estimated 300 grizzly bears in Glacier National Park. Numerous state and federal agencies have worked together to manage and recover the grizzly bear population in the Northern Continental Divide Ecosystem (NCDE), including Glacier National Park. The Northern Continental Divide Ecosystem encompasses about 9,600 square miles of northwestern Montana and includes Glacier National Park, parts of the Flathead and Blackfeet Indian Reservations, parts of five national forests, Bureau of Land Management lands, and a significant amount of state and private lands.